When I was hired by McKesson (NDC Health at that time), our training group was tasked with rebuilding 16 Modules of software training from the ground up. Our blended solution combined an in-house Learning Management System with customer configurable curriculum, all built out with Flash Templates to increase the interactivity, engagement, and efficiency for us building the piece. I designed, with the help of the team, multiple types of page templates. We had a standard flow of page types, but, there was flexibility to customize that flow when needed. The training course has been in use for over five years (still in use), and has been completed by thousands of pharmacy users. 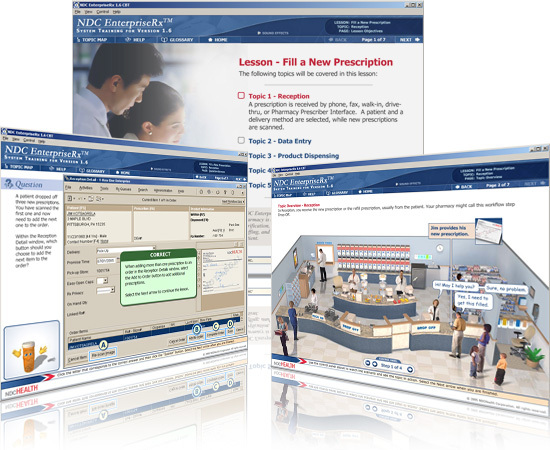 We'd combine this computer based training with instructor lead training, training games, and printed job aids to ready each pharmacy for the product launch.